The RetroSound® Newport is a direct-fit replacement radio for your classic 1988-95 Cadillac DeVille. Newport looks and fits like the original factory radio, but boasts the most modern technological features. An Apple Made-For-iPod®/iPhone® interface is built in, as is Bluetooth® connectivity for hands-free phone calls and wireless audio streaming. Newport features a dual color (amber or green) color display and backlit buttons. Two USB ports for iPod®/iPhone® or flash drive (one on the front panel and one in the rear) plus two standard auxiliary inputs are included. Newport has a built-in 25 watts x 4 channel power amplifier as well as front and rear RCA pre-outs - plus subwoofer output - to add external amplifiers. It mounts seamlessly into your vehicle with the included mounting hardware and wiring harness. 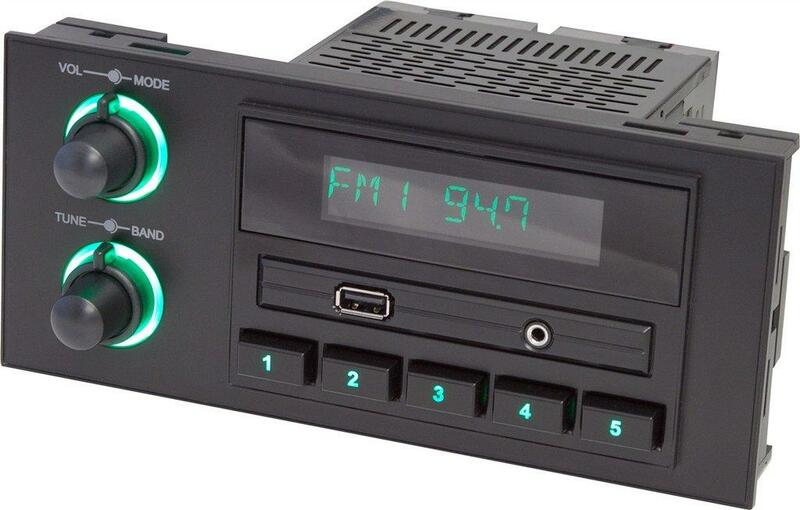 Until now, the only solution for your vehicle has been to install a standard DIN-sized radio - an installation that looks awkward and out of place. Now you can have the most modern features without sacrificing the looks of your classic car or truck.